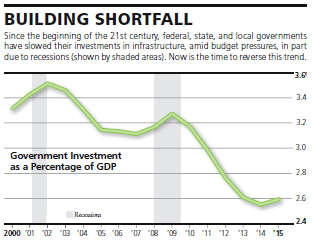 What Should the Federal Government Do about Infrastructure? Any new federal spending must take into account that federal public debt now stands at 77% of GDP and is likely to keep rising given the demographic pressures on entitlement spending. This means that the long-term outlook for public finances is dire. With a current low unemployment rate of 4.4% and a high of 6 million job openings, the economy does not need more government stimulus at the present time. 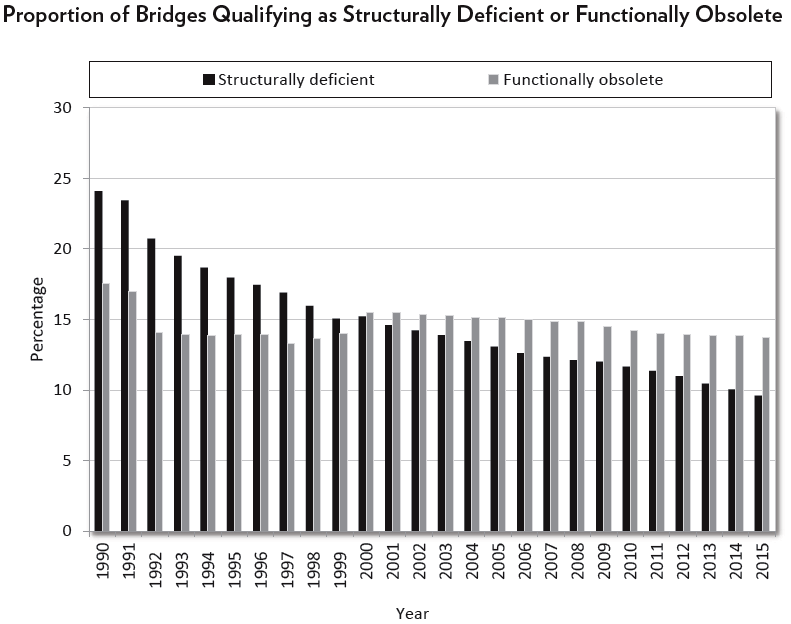 Bridge quality has improved substantially since 1990 (see chart) although roadway congestion has become more acute (second chart). Rail and transit systems appear to be the main areas with observable deterioration. 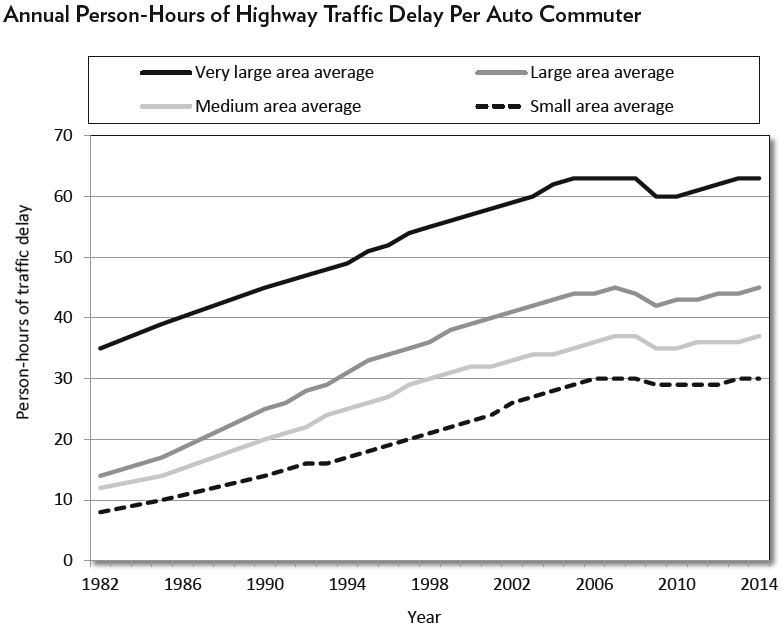 The difference between state highways (which are in good condition), local roads (which are in fair condition) and transit systems (which are in poor condition) is simple: state road maintenance is paid almost entirely out of user fees (gasoline taxes), local road maintenance is paid for by a combination of taxes and user fees (motor vehicle registrations and parking meters) while transit maintenance is paid for almost entirely out of taxes. Privatize areas where government is not needed such as airports, air traffic control systems and railways (Amtrak). Localize decision making as far as possible such as decentralizing responsibility for transportation infrastructure back to the states. Remove payment barriers for charging users. This could reduce the cost of capital investment required for highway systems by 30%. Level the playing field for private sector funding. Currently interest income received for investing in municipal bonds is tax free which is not the case for private debt. First, and most important: national security. Second, our roads and bridges must be repaired and rebuilt. 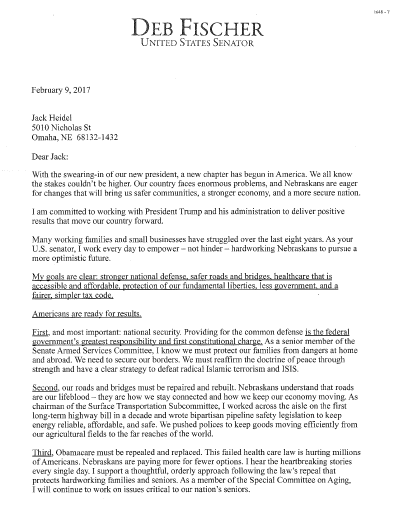 Third, Obamacare must be repealed and replaced. Fourth, our fundamental liberties must be protected. Fifth, government must shrink and the tax code must be simpler and fairer. I don’t disagree with the specifics of any of these five goals but rather where the emphasis is placed. Her first two goals are to greatly increase spending for both the military and for infrastructure projects. Her last goal is to shrink the federal government which is a good idea but very hard to accomplish in practice. Here is the basic problem our national debt (the public part on which we pay interest) is now at 77% of GDP, the highest it has been since right after WWII, and steadily getting worse. Right now this approximately $14 trillion debt is essentially “free” money because interest rates are so low. But when interest rates inevitably rise to more normal levels, interest payments on the debt will soar by hundreds of billions of dollars per year and eat much more deeply into tax revenue. It should be a very high priority for Congress to establish a plan to bring government spending more closely in line with tax revenue. I have previously described how this could be accomplished over a ten year period without cutting hardly anything but simply using restraint for spending increases. Conclusion. If Senator Fisher feels that it is necessary to make big spending increases in areas such as national defense and infrastructure repair, then she should be equally adamant about the need to hold down the growth of government spending overall. 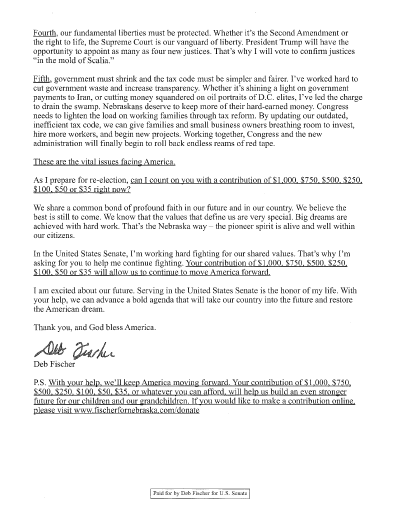 As the readers of this blog well know, I am very concerned about the fiscal and economic direction our country has been taking in recent years. I voted for Hillary Clinton in the 2016 presidential election because of Donald Trump’s crude and sleazy behavior. However we need basic change in the U.S. and Mr. Trump is clearly a change agent. Treasury Secretary designee, Steven Mnuchin, says that tax cuts for both upper-income and middle class taxpayers will be offset by “less deductions that pay for it.” Revenue neutral tax rate cuts will increase both consumer and investment spending, without increasing our debt, and will give the economy a huge boost. Health and Human Services Secretary designee, Rep Tom Price, is an expert on health-care and wants to replace the Affordable Care Act with a new healthcare program which provides more consumer choice at a much lower cost. The Great Rebuilding. Infrastructure investment is needed but it should be accomplished with a lower corporate tax rate and repatriated profits of multinational corporations to avoid increasing the deficit. Holdback on excessive fiscal stimulus. With the unemployment rate down to 4.6%, a dollar which has already appreciated 40% since 2011, and tax cuts on the way, inflation and higher interest rates are in the offing. Let’s not overdo it. Living on borrowed time. As shown in the above chart, interest rates are very, very low and are likely to rise significantly in the near future. When this happens, our massive public debt (on which we pay interest) of 76% of GDP will become very expensive to service. Ouch! Conclusion. One can see a Trump agenda emerging which has the potential to be very successful if it is coupled with overall spending restraint. New York Times columnist Paul Krugman is perhaps the most ardent Keynesian economist in the U.S. today. Let’s agree that Mr. Krugman is a very intelligent and articulate fellow. He is a Nobel Prize winner and undoubtedly has made important contributions to economics. But he has the absolutely nutty idea that extreme deficit spending not only doesn’t hurt our economy but can actually be beneficial. His column, “Time To Borrow” in yesterday’s NYT is a perfect example of this dangerous idea. Our national debt of $19 trillion is just a big scary number. 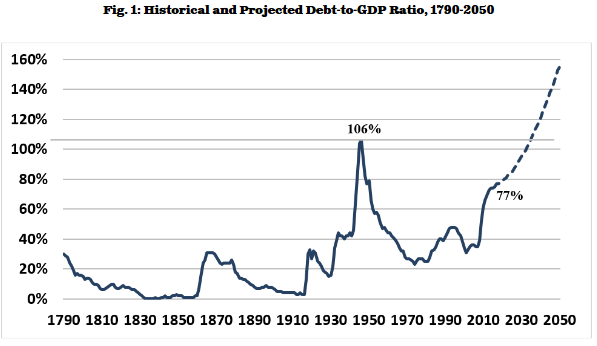 Actually just our public debt alone of $13 trillion (on which we pay interest) is 75% of GDP, the highest since the end of WWII, and is projected (by the CBO) to steadily become much worse. Federal interest payments are only 1.3% of GDP, low by historical standards. Just lock in repayment with 30-year inflation protected bonds, yielding .64% interest. Okay, suppose we can lock in very low interest payments on our current debt and therefore just borrow away oblivious to total debt for the next 30 years. In 2046 I expect to be gone but my children and grandchildren will still be around. Why should they be stuck with paying off or refinancing our own extravagant debt at likely much higher interest rates? There are pressing infrastructure problems all over the country which need fixing now. 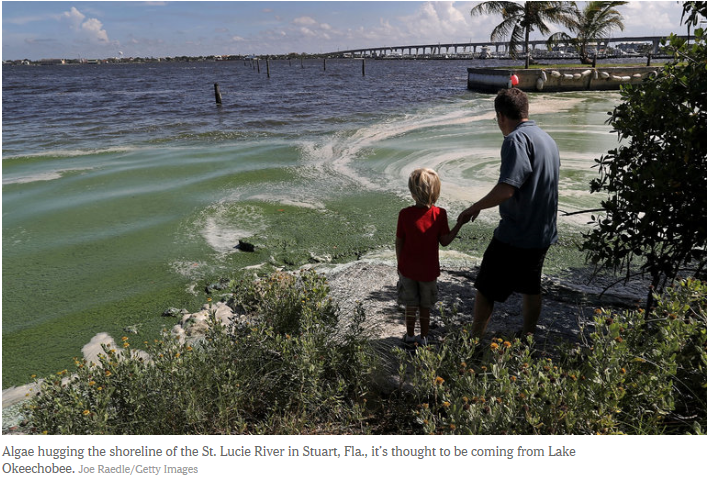 For example, in Florida, green slime infests beaches because of failure to upgrade an 80 year old dike. The answer is to let Florida voters decide if they want to issue bonds for this project and pay them off with state tax revenue. Nebraska, for example, has decided to raise its state gas tax by 6 cents/gallon in order to pay for infrastructure upgrades. Conclusion. The U.S. is currently in a huge fiscal bind with massive debt and continuing large annual deficits. It is extremely reckless to continue even current deficit spending, let alone increasing it, for anything less than a true national emergency. Infrastructure repair, for example, is an important but routine need which should be paid for out of current tax revenue. The former CEO of Nucor Steel Company, Dan DiMicco, has written a book, “American Made: why making things will return us to greatness” describing why and how U.S. manufacturing dominance has shrunk in the past 50 years and how it can be restored. Nucor is the largest American steel company and has never laid off an employee in its 42 years in existence, even during the recent recession. 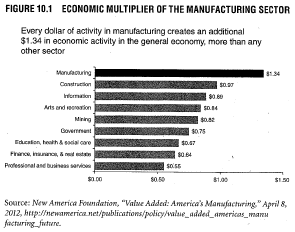 Build public-private partnerships to restore the manufacturing base. For example, only $60 billion out of the $765 billion stimulus bill in 2009 was devoted to infrastructure spending. As another example, the corporate income tax rate should be significantly lowered. Level the playing field in international trade. When Germany and Japan built up huge trade surpluses in the 1970s and 1980s, the Reagan Administration responded with the Plaza Accord in 1985 outlawing foreign currency manipulation. Since then China especially has adopted a strongly mercantilist trading policy, subsidizing key industries, exporting as much as possible and importing as little as possible. No president since Reagan has insisted on equitable rule-based trade agreements where the rules are enforced. This would help immensely. Rebuild the nation’s infrastructure. Mr. DiMicco would be willing to increase deficit spending for such needs as highways, bridges, fiber-optic lines, mobile networks, and urban wastewater systems. Develop our energy resources. Go all out on natural gas production by fracking. This will lower our carbon footprint and has the potential to make us completely energy independent, thereby greatly reducing our trade deficit. The skills gap myth. It would help if the U.S. had better career education for high school students unlikely to go to college. But Nucor sponsors cooperative training programs at all of its locations and has no trouble finding workers. A strong revival of U.S. manufacturing has the potential to create 30 million new jobs and thereby revitalize the American middle class. Mr. DiMicco’s prescription makes a lot of sense. An activist monetary policy to do whatever it takes to sustain sufficient demand in the economy. A credible commitment to sustainable fiscal policy. Some have argued that fiscal consolidation is incompatible with economic recovery. But recent experience, e.g. sequestration in the U.S. and a balanced budget in the U.K., has shown the reverse. An ambitious program of supply-side reform. The U.S. has a booming technology sector and the fracking revolution. 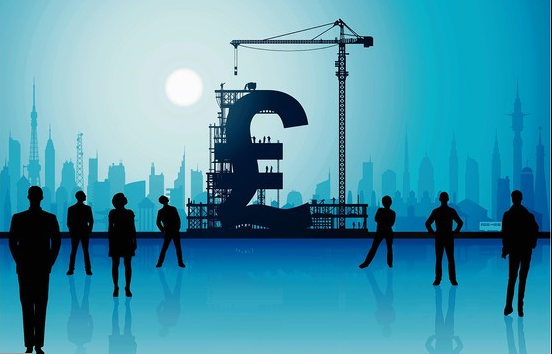 The U.K. has cut its corporate tax rate to 20%, welcomes disruptive innovation and is pushing ahead on shale gas. In the U.S. things are moving in the right direction and so the focus needs to be on keeping the momentum going. Monetary stimulus has accomplished much but now a sound exit policy is needed. Sequestration has slowed down the growth of government debt but has not ended it. Further progress will require entitlement reform, especially for Medicare and Medicaid. But first, the Affordable Care Act needs to be improved to do a better job of controlling the overall cost of healthcare. Infrastructure improvement, tax reform and expanding trade are the supply side keys to increasing productivity and shared prosperity. Activist monetary policy, credible fiscal policy, and ambitious supply side reform: these are the policies which will lead to future progress! The economy added 321,000 jobs in November, the most in one month since January 2012. The unemployment rate of 5.8% remains steady and is down from 7% in November 2013. The average hourly earnings for workers is up by 2.1% from a year earlier. Economic growth for the third quarter is up 3.9% from the previous quarter. The deficit for the 2014-2015 fiscal year was “only” 2.8% of GDP and is predicted by the Congressional Budget Office to drop to 2.6% for the current year. The price of a gallon of gasoline has dropped to $2.71 on average, its lowest level since 2010 and is still dropping. Infrastructure. The continuing drop in the price of gasoline offers the opportunity to replenish the inadequately funded Highway Trust Fund in a fiscally responsible manner. Congress should raise the federal gasoline tax above its current 18 cents per gallon to a level which is sufficient to fund the entire federal share of highway construction and repair. Tax reform. Individual and corporate tax reform will give the economy a huge boost. The idea here is to lower tax rates in a revenue neutral way by closing loopholes and deductions. Expanding Exports. What’s needed here is to give the President fast track negotiating authority so that Congress has to vote any trade agreement up or down without modification. This is the only way to get other countries to make concessions. Of course there are many other issues which need to be seriously addressed by the new Congress. But relatively quick action on just these three less controversial items would be a great start!